A sunny day brings holidaymakers to Echo Lake beach. The sandy beach has a beautiful view of the waters of Echo Lake and the rolling hillsides in Echo Valley Provincial Park. Patches of green lush trees sit along the hillsides. The green hillsides is a wonderful contrast to the calm blue waters of Echo Lake. 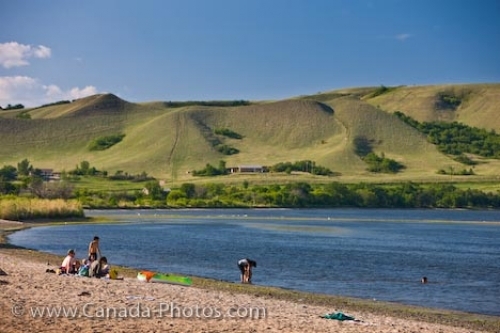 Holidaymakers on the shores of Echo Lake in Echo Valley Provincial Park, Qu'Appelle Valley, Saskatchewan, Canada.